Basic Windows PC security involves giving users and administrators different rights. Users accounts allow them to perform certain limited functions, which does not include installing software or making certain changes to the computer. An administrator account allows one to install software or make any changes to the computer. PC users thought it was too much of a hassle to have to log out of their user account and log back in as an administrator in order to install software or make changes to the computer. So most people always logged in as administrator. This made it convenient for them, but also convenient for hackers to install malware and make changes to their PC. In order to increase security, with Windows Vista, Microsoft created the User Account Control. This allowed users to always log in as administrator, yet still receive a warning when something normally accomplished with administrator's rights was occurring. When someone or something attempts to install software or make changes to the computer, the screen dims and the User Account Control dialog box appears, displaying the message "Windows needs your permission to continue". The action will not take place until the user clicks the [Continue] button in the User Account Control dialog box. Unfortunately users found the User Account Control dialog box to be just another annoying Windows nag (remember the "You have unused icons" nag) and whenever it appeared they just automatically clicked the [Continue] button, without thinking. So in Windows 7, Microsoft attempted to make the User Account Control less annoying. 1. In Control Panel select the User Accounts and Family Safety group. 2. In the User Accounts and Family Safety group, click on User Accounts. 3. On the Make changes to your user account page, click on Change User Account Control Setting. 4. If the annoying User Account Control dialog box appears, click on the [Yes] button. 5. In the User Account Control setting dialog box, as you move the slider control, a description of the notifications you will receive appears to the right of the control.v 6. Set the level of notifications you desire, then click on the [OK] button. 7. Restart the computer to put the change into effect. Now that the user has control of the User Account Control, hackers have found ways to turn it off. Many times hackers trick users by requiring them to turn off the User Account Control to install a seemingly desirable piece of software, then they install malware along with the requested software. But many times hackers have used Windows bugs and vulnerabilities to turn off the User Account Control. Nearly one-in-four PCs that reported malware detections to Microsoft had the User Account Control turned off. 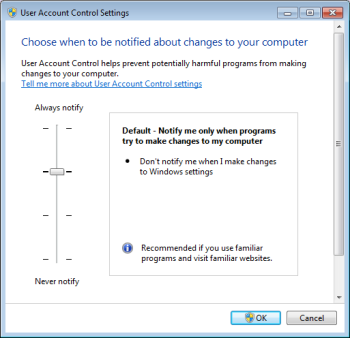 Use the steps above to make sure that the User Account Control on your PC is not turned off. It may be annoying, but I personally configure my User Account Control for maximum protection.